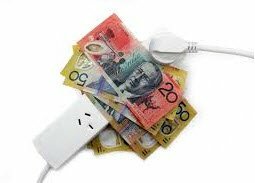 Southeast Queensland’s electricity bills are set to rise, and will continue to do so for another five years, as the state government raises dividends for state-owned energy companies Energex and Ergon Energy. Dividends are set up to fund concessions for hospitals, schools and other vulnerable energy consumers. However, in just one year the state government has tripled the amount payable from Energex from $406 million to $1.3 billion. Ergon Energy has also climbed sharply from $392 million to $1.9 billion. These state-owned electricity companies are not going to supply these funds from their profits; no they are going to grab that $3.1 Billion from you, the Gold Coast home owner. The Chamber of Commerce and Industry Queensland has described this as entirely unacceptable, and as Energex recorded a profit of $730 million in the 2014-2015 financial year, we would have to agree. Many Gold Coast home owners are taking matters into their own hands and making the switch to solar. 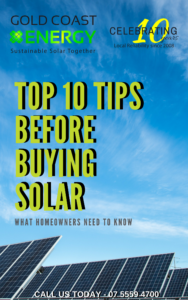 Solar allows home owners to reduce their energy costs and their carbon footprint. With solar rebates still available, now is a great time to invest and save five years off electricity price rises. Plus, with the newly released Solar Batteries, solar savings have never been higher. The Renewable Energy Scheme. 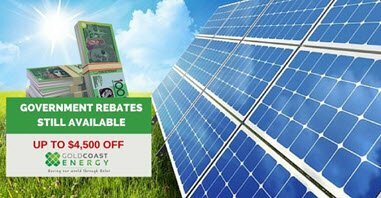 The Federal Government provides a rebate that will give you a substantial saving on the purchase price and installation of your solar system from GC Energy. The Queensland Solar Bonus Scheme. This incentive pays eligible customers for the electricity generated from eligible solar photovoltaic (PV) systems and exported to the Queensland electricity grid.Due to the different levels of competition within the retail electricity market on the Gold Coast, retailers voluntarily offer competitive feed-in tariff rates in the south east. This allows Gold Coast home owners to gain the most benefit by being able to shop around for the best solar feed-in tariff rates. The solar experts at GC Energy offer an obligation free quote. If you’d like to know more about which solar system, rebate and incentive would best suit your home and lifestyle, contact us on 07 5525 2111.